I'll have a Martini like the gentleman over there with the broad. And then there are times when the improbable becomes not only possible, but reality. And in Hollywood reality is something rarely seen. Remember all that talk about Disney getting a distribution deal with DreamWorks? How it was in the running for it along with Steven Spielberg's old home Universal Studios? And naturally Universal won out... but then didn't. At the last moment the deal fell through and the Mouse was there to take on a roll that was thought impossible. Here is another such case. Just as improbable, but possible. I've been a fan of the old Dean Martin "Matt Helm" films since I was a kid. Sure, they're cheesy, guilty pleasures, but in a world filled with the negativity we find rampant, it was a refreshingly silly break from the environment outside your window. Good was good and bad was bad. And when it was all over there was a fresh martini to drink and a beautiful woman to love. Of course, the Matt Helm of those films bears almost no resemblance to the one you find in Donald Hamilton's novels. No one has ever really explored what an adventure with the real Helm would be like. Variety is reporting that Spielberg is interested in turning that into a reality. Until a year or so ago we got word that DreamWorks had hired Paul Attanasio to do a rewrite on a new film version of the American spy. It has now been confirmed that Spielberg will produce the project. Were he to direct it, he and his DW partners would likely co-produce the film with Disney. The Helm project is one of many that Paramount Pictures retained ownership of in the divorce between the two companies last year. Spielberg and company would have to convince the studio to give up a hefty percentage of the production, something not likely unless Paramount finds themselves in a severe cash crunch. 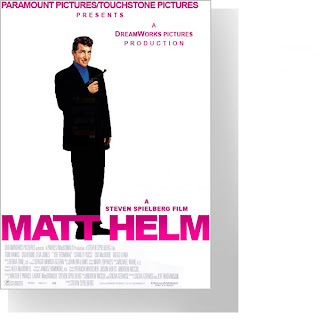 So, with Sony having James Bond, Universal has Jason Bourne and Disney could have had Matt Helm. And they may still have. Remember, this is Hollywood and things can change on a dime. After all, that Universal deal with DreamWorks is doing swell, ain't it? I'm still waiting for the Condorman remake.